Our website address is: https://philipsburgpharmacy.com. 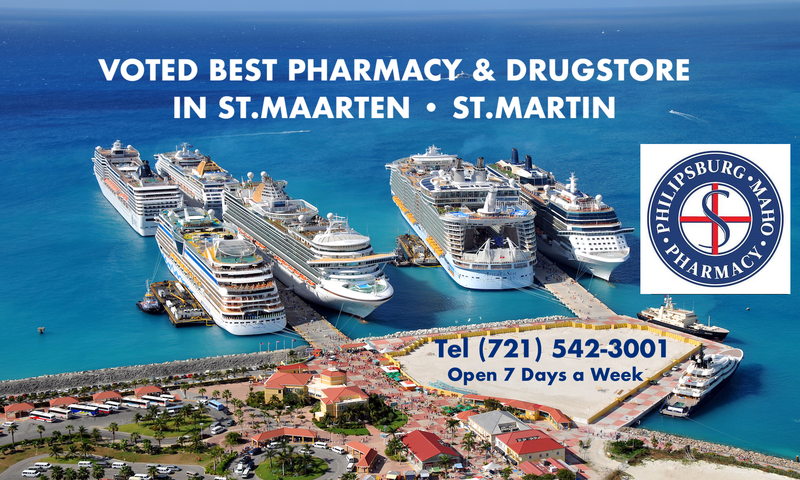 We are a licensed, privately held group of retail pharmacies on the Dutch West Indies island of St.Maarten. Communications; Email Address Collection. In order to receive certain communications from us, such as responses to user inquiries, you will be required to submit your email address to us. You may also provide your email address to us in order to receive updates and news even if you do not sign up for an account or make a purchase. Any non-Service related email you receive from us will include an unsubscribe link that will allow you to opt-out of receiving future emails. It may be necessary to send you Service-related announcements. For example, if the Service is temporarily suspended for maintenance, we may send users an email. You may not opt-out of Service-related emails which are not promotional in nature. User Content. The Site may allow you to post or submit comments or other information, such as in response to our blog content (www.philipsburgpharmacy.com/blog) (“User Content”). We may use User Content to improve the Site and we may save User Content or other content you post indefinitely. Automatically Collected Information. Similar to other websites, we may collect some information automatically from you and store it in log files. This collection may include, but is not limited to: your domain name and host for Internet access, the Internet address of the site from which you came, the date and time of your access, your computer’s IP address and information about its operating system, browser, and host, the date and time you access the Site and the pages you visit. We collect this non-identifying information in order to help diagnose problems and to administer the Site. We also use it to help identify you and to gather broad demographic information. We may automatically collect information using various mechanisms, including but not limited to cookies and pixels. Use of Non-Personally Identifiable and Aggregate Information. We may use non-personally identifiable information and aggregate information for any lawful purpose, including, but not limited to, analyzing trends, managing and administering the Site, tracking users’ movements, for research purposes, or to improve our business and the Site. In addition, we may share aggregate statistical information with our business partners. We may also combine your non-personally identifiable information and aggregate information with other non-personally identifiable information and aggregate information collected from other sources. Affiliated Entities and Service Providers. We may disclose your information, including personal information, to any affiliated entity or organization, business partner, and to agents and service providers to help us operate the Site, improve our business or the Site, and to provide services to us. These third parties may include customer service providers, business or sales service providers, or providers that provide support for the Service. Disclaimer. Due to the complexity and open nature of the Internet, no transmission of data over the Internet can be 100% secure. There is always a risk that information collected by and/or displayed on the Site may be compromised or accessed notwithstanding the steps we take to secure your information. For example, a third party may unlawfully intercept or access transmissions or private communications, or other users of the Site may abuse or misuse your personal information. Accordingly, you agree that you are providing such information at your own risk. Keeping your information secure is of great concern to us. We exercise care in facilitating the transmission of information between your device or computer and our servers (or the third party servers that operate and store information for the Site). Any personally identifiable information collected by the Site is stored in operating environments that are not available to the public. While we have mechanisms in place to safeguard your personal information after we receive it, no transmission of data over the internet can be 100% secure. To comply with EU General Data Protection Regulation (“GDPR”), our EU customers must sign our Data Processing Agreement (“DPA”) and the Standard Contractual Clauses to establish the respective responsibilities between you, our customer (as the data controller) and Philipsburg Pharmacy itself (as the data processor). If the GDPR applies to you please download, sign, and email both the DPA and the Standard Contractual Clauses to privacy@philipsburgpharmacy.com. Both the DPA and Standard Contractual Clauses are available in one document. * Note you must sign in two places. By using the Site, you understand and consent to the collection, storage, processing, and transfer of your information to our facilities in the United States and those third parties with whom we share it as described in this policy. California Shine the Light Law. California Civil Code Section 1798.83 permits users who are California residents to obtain from us once a year, free of charge, a list of third parties to whom we have disclosed personal information (if any) for direct marketing purposes in the preceding calendar year. If you are a California resident and you wish to make such a request, please send an e-mail with “California Privacy Rights” in the subject line to privacy@philipsburgpharmacy.com. California Minors. While the Service is not intended for anyone under the age of 18, if you are a California resident who is under age 18 and you are unable to remove publicly-available content that you have submitted to us, you may request removal by contacting us at: privacy@philipsburgpharmacy.com. When requesting removal, you must be specific about the information you want removed and provide us with specific information, such as the URL for each page where the information is located, so that we can find it. We are not required to remove any content or information that: (1) federal or state law requires us or a third party to maintain; (2) was not posted by you; (3) is anonymized so that you cannot be identified; (4) you don’t follow our instructions for removing or requesting removal; or (5) you received compensation or other consideration for providing the Content or information. Removal of your content or information from the Service does not ensure complete or comprehensive removal of that content or information from our systems or the systems of our service providers. We are not required to delete the content or information posted by you; our obligations under California law are satisfied so long as we anonymize the content or information or render it invisible to other users and the public. You may access, update, or delete your personal information by contacting us at privacy@philipsburgpharmacy.com. We will make good faith efforts to resolve requests to correct inaccurate information except where the request is unreasonable, requires disproportionate technical effort or expense, jeopardizes the privacy of others, or would be impractical.